These uplifting quotes that will strengthen your faith, boost your spirits, and spark positive change in your life today. How do people who face tough situations and difficult challenges find strength? 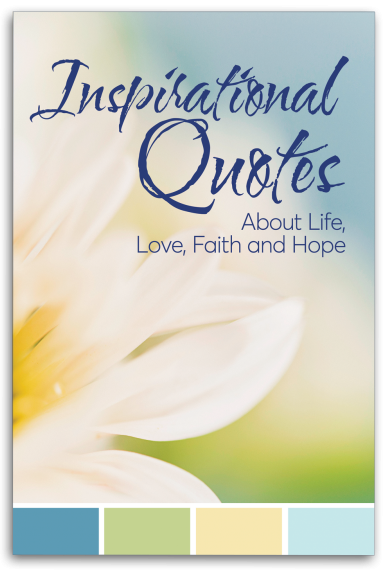 Read the words of amazing people from all walks of life share their wisdom on life, love, faith, and hope. From prisoners to presidents, athletes to actors, spiritual leaders to singers—all these people have a message for you. For example, how did Heather Mercer, an aid worker who was called to give humanitarian assistance in Afghanistan, find faith and courage while the Taliban held her hostage? Her words in this FREE eBook will inspire you to discover your own inner reserves of strength and resilience. Even when relationships hit rough patches and life throws you a curveball, which tests your faith, God’s love is with you. When you read the words of other people who have been there—who have faced these challenges and overcome them—you’ll discover your own inner resources to do the same. In this FREE eBook, you’ll find positive words that will offer you encouragement. Each inspirational quote is like a daily vitamin of positive thinking for your spirit. You can turn to them again and again when your soul is weary or you’re feeling down. These are truly words to live by on subjects that all of us need guidance about occasionally. This collection of inspiring and motivational quotes can be yours free of charge. So give yourself the gift of inspiration, and download Inspirational Quotes about Life, Love, Faith, and Hope now.